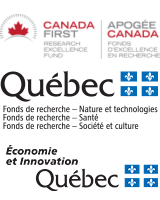 The Healthy Brains for Healthy Lives (HBHL) initiative is a high profile, high priority multidisciplinary and cross-sectoral initiative located at McGill University made possible with support from the Canada First Research Excellence Fund (CFREF) and Fonds de recherche du Québec (FRQ). The HBHL Strategic Research Plan outlines the vision, deliverables, and overall goals of the initiative, and the research priorities of its four research themes. HBHL’s Innovative Ideas Program will support the exploration of novel and innovative ideas with the potential for breakthrough science. Be a high-risk, novel line of inquiry that has the potential to generate knowledge, technologies, tools, products, and/or services with “transformative” potential. Directly address the research priorities of one or more of HBHL’s four research themes. Contribute to the HBHL overall goals and deliverables. Applicant: The applicant must be a McGill faculty member who is eligible to hold Tri-Agency research funding. Per competition, a researcher may submit only one (1) application as applicant, but may be a co-applicant on other applications. Co-applicants: Co-applicants must be a faculty member from McGill University or from one of our CFREF partner institutions (Western University, Université de Montréal or University of British Columbia). All co-applicants must be eligible to hold Tri-Agency research funding. Grant funding may be transferred to co-applicants. Collaborators: Collaborators may be participants from McGill or other academic institutions, industry, or other organizations who participate in the project in a meaningful way. Grant funding may NOT be transferred to collaborators or their institutions. Anyone who is included in the budget for salary compensation cannot at the same time be a collaborator (i.e., students, postdocs, research associates). Collaborators may provide letters of support to describe their participation in the research project. The envelope for this competition ($1,720,000) has the following funding sources: $500,000 from FRQ and $1.22 million from CFREF. For awarded projects, the applicant is not required to select a funding source. The funding source will be determined at the award finalization stage. This is an administrative decision based on eligibility with the funding source, e.g., FRQ funding cannot be transferred to partner institutions outside of Quebec, while CFREF funds may be transferred to co-applicants from eligible partner institutions in Canada (Western, UdeM, UBC). Eligible expenses include direct costs, such as salary and benefits for research personnel, supplies, travel, small equipment, workshops, computers, and services. All expenses must adhere to guidelines in the CFREF Administration Guide or FRQ Common General Rules as appropriate. Full application (by invitation only). LOIs and the full applications must be submitted through the HBHL online forms. Submissions must be received by the deadline. Late submissions will not be accepted. Access to the online form will be blocked at the time of the deadline. Incomplete submissions will not be reviewed. Submission format: Please use templates provided (please see Important documents and templates section). Label the file with the applicant's Last name, First name (e.g. Smith, John.pdf), upload the proposal to the HBHL online form and hit the submit button. You will receive an acknowledgment email for your submission. 1. Summary: Describe the proposed project: Objectives, Work plan, Team, Anticipated outcomes, and specific deliverables. Provide timelines for the achievement of milestones (1-page maximum). 2. Alignment with HBHL: Describe how the research project aligns with HBHL’s goals and research priorities and how it relates to at least one of HBHL’s four research themes. Refer to the HBHL Strategic Research Plan. Describe how the project will help realize HBHL’s deliverables (1/2 page maximum). 3. Budget: Indicate the total amount requested and the breakdown per year (maximum $200,000 over 2 years). Provide a high-level description of the budget items (1/2 page maximum). For each applicant and co-applicant, provide a 2-page biosketch that includes: Name, Affiliation; Education/training; Employment/affiliations; Research funding in the past four years; Most significant contributions (up to 5). Note: Please do not submit biosketches for collaborators. Please use the templates provided for the research proposal, budget and biosketches. A lay summary of the project (150 words maximum). This is for HBHL's communication purposes and may be posted on its website for awarded projects. It should address: i) research question, objectives, and approach; ii) contribution and alignment with HBHL overall objectives; and iii) broader socio-economic and/or environmental impacts. Provide the name, affiliation, email and three most relevant expertise keywords for each of eight researchers who would be qualified to review your proposal and who are not in a conflict of interest (see guidelines). The reviewers may be based in Canada or internationally, but must be external to McGill University. 1. Summary: Summarize the project and the anticipated outcomes (1/2 page). 2. Introduction: Background information and the rationale (1/2 page). 3. Alignment with HBHL: Describe how the research project aligns with HBHL’s goals and research priorities and how it relates to at least one of HBHL’s four research themes. Refer to the HBHL Strategic Research Plan. Describe how the project will help realize HBHL’s deliverables. Provide timelines for the achievement of milestones and deliverables (1/2 page). 4. Research plan: Describe the specific aims of the project, and elaborate on how these aims will be achieved, which methods will be used, and what outcomes will be produced (3 pages). 5. Research team and partnerships: Describe the research project leadership and team and the nature of any collaborations and partnerships. Describe any relation between this proposal and funding currently held or applied for (1/2 page). Note: Applicant must include all the necessary information (including tables, figures and a list of references) within 5 pages. Please note that extra pages will be removed from your application. Provide details of the anticipated expenses, and how they were calculated. Justify why these expenses are necessary to the project. Mention any relevant quotes from suppliers for materials or services >$10,000. Specify any co-funding contributions from collaborators, industrial partners or foundations. For each applicant and co-applicant, provide a 2-page biosketch that includes: Name, Affiliation; Education/training; Employment/affiliations; Research funding in the past 4 years; Most significant contributions (up to five). Applicant and co-applicant(s) are invited to describe any career interruptions to explain impact on productivity. If this option is chosen, an additional maximal half page (only for this purpose) may be added to their 2-page CV. Letters of support from collaborators or other partners. Letters must be on official letterhead and outline the contributions (materials, expertise, co-funding, etc.) to the project, and whether such contributions are in cash or in-kind. Quotes for materials or services from suppliers can be included. Letters of support are in addition to Research Proposal page limits. The project represents an innovative, significant line of inquiry that has the potential to generate knowledge, technologies, tools, products, and/or services with “transformative” potential. The project addresses important gaps in technical capabilities, translational potential, and/or research progression and has a strong potential to stimulate additional research questions beyond the term of the grant. The project will make major advances pertaining to HBHL deliverables and is closely aligned with the research priorities of one or more of the HBHL research themes. Timelines and milestones are well defined. All LOI applicants will be notified by email of the results of the LOI selection. Successful LOI applicants will be invited to submit a full application. The project represents an innovative, significant line of inquiry that has potential to generate knowledge, technologies, tools, products, and/or services with “transformative” potential. There is a clear and feasible implementation plan (e.g. activities, timeframes, and milestones). The project effectively leverages HBHL core facilities. The leadership is well qualified to manage and deliver the proposed research objectives, is committed to tracking milestones and deliverables linked with the project and providing all relevant information to the HBHL administration for reporting purposes. Appropriate partnerships are set up that define partner roles and in cash or in-kind contributions. The budget request does not exceed the maximum grant value. The expenditures appear reasonable and appropriate. All applicants will be notified by email of the results of the competition. Successful applicants will be sent a Notice of Award. It is the applicant’s responsibility to complete the Acceptance of Award form and other required documents including the McGill’s Office of Sponsored Research (OSR) checklist by the indicated date.